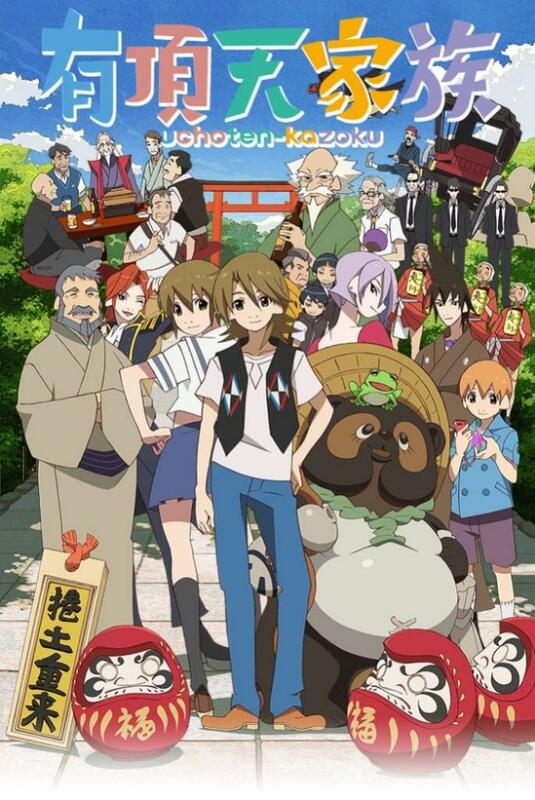 After painstakingly setting through 23 series this season and being virtually unimpressed by nearly every single one, it is only by pure coincidence and irony that Uchouten Kazoku – The Eccentric Family has become my favorite of Summer 2013 as well possibly best series. Created by P.A works, the same studio that produced Red Data Girl – a series of great disappointment for me last season, The Eccentric Family does very well on both the fronts of storytelling and visual appeal. Focusing on the theme of family and family dynamics that is played out through one brood of tanuki masquerading as humans, The Eccentric Family turns out to be an engaging mix of laughs and heartfelt moments that works far better than it sounds and very poignant when comes down to its message about the bonds of family. Once a prominent family of Tanuki society, the Shimogamo are left less than that after the death of their noble father – whose fate is sealed after fallen prey to a certain group of humans known the “Friday Fellows”. This story follows his 4 children: 1st son Yaichirou, 2nd son Yajirou, 3rd son Yasaburou, and 4th son Yashirou along with mother to rediscover the legacy he left behind and solving what happened that day. Of course, this legacy – this family is the definition of dysfunctional: Yaichirou is serious and stern, Yajirou is a frog living at the bottom of a well giving advice (he forgot how to transform back to normal), Yashirou is young and innocent, their mother takes on both a mother and father paternal role (often dressing like a male), and Yasaburou…well he is a pure idiot and more like his dad than he will ever know. It’s not the perfect family, but an endearing one that like all others, finds way to make things work out as normally as possible and deeply cares for one another. From the onset, The Eccentric Family proves itself to anything short of a tamed series, with it introducing the viewer to a world of humans unknowingly living alongside mythical beings of their own folklore: tanuki and tengu. It’s an attractive premise, but also a very functional one as it explores the daily misadventures of Yasaburou and his family eventful lives; in hopes of one day gaining their father’s former glory and escaping the loser stigma cast upon them. 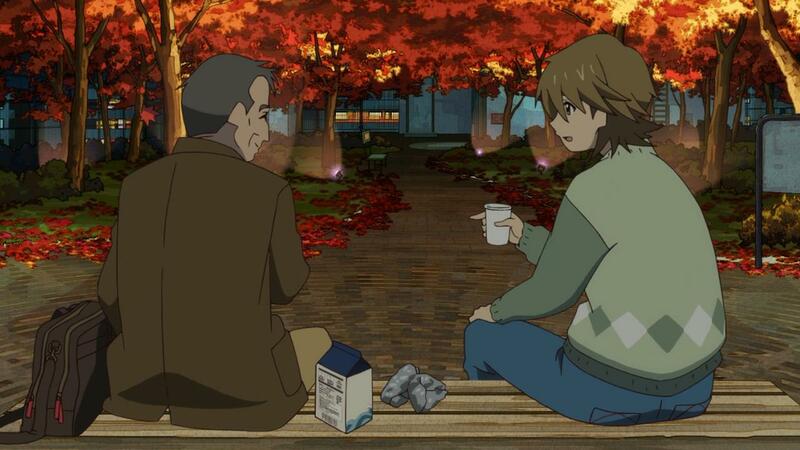 While the first half of the story is far removed from any the drama the second half presents, the comedy angle actually does a pretty adept job of unraveling the story the Eccentric Family has in store, as it wildly introduces the denizens of the world in a mirthful manner, also very mindful to let the viewer know that something significant lurks underneath it all. With the story mostly told through the perspective of Yasaburou, the proceed at a brisk pace, as he learns more about his father’s death and briefly reflects about what he remembers about him as well as the other characters that dispense said information. 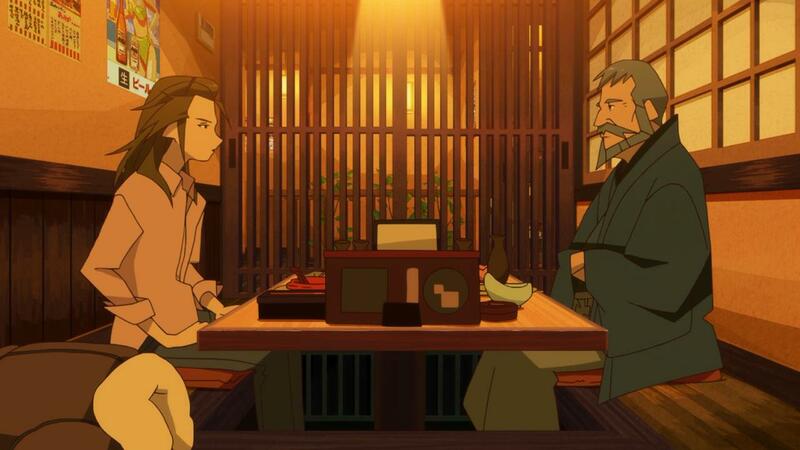 Despite this being a journey to learn about his father, Yasaburou’s pensive recollections also teaches him more about his family and the people around like professor Akadama and his estranged protege, Beten, a human woman who is just as incomprehensible and free-willed as Yasaburou – and obviously carries some complex burdens of her own that adds to part of the stories drama elements. However, once the second half does kick into gear, it becomes far from enticing tale – with the eldest brother running for position of next leader of the tanuki against his uncle and where the story begins to make some interesting headway. The writing and execution for the first half is great no doubt, but really shines here as it dodges much of the melodrama as it reveals the string of events that leads to the family patriarch’s passing, and the culmination of all the characters involved converging in one setting. Being a character driven affair like most of P.A works offerings, it is very difficult to quantify how great the characters are and their ability to move the story as far as it goes. Even the goofy ones such as the Shimogamo brothers twin cousins, Ginkaku and Kinkaku (you think of them as a cross between dumb and dumber and beavis and butthead) and mysterious one such as their sister Kaisei, move the plot along in insurmountable ways. 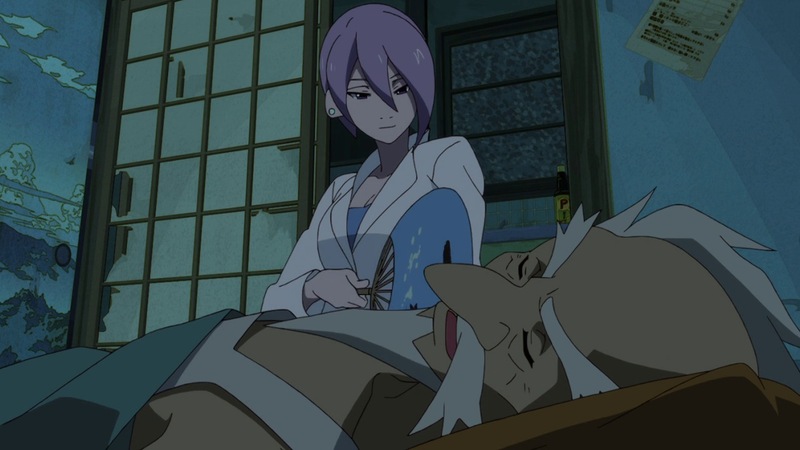 Its shame that the story not explore characters like Benten and Kaisei more, and really would been nice as much as they are mentioned and/or seen. Despite having a very positive reception of the storytelling this time around, I am oddly perplexed since P.A Works animation seems to be greatest champion for the series. Visually speaking, this series is not that much different from the studios usually brand of quality; especially last seasons Red Data Girl that incorporated the same traditional Kyoto aesthetic of vivid backgrounds and foregrounds accented with warm color shades. Instead, it actually seems like the visuals are to better use than they were for RDG and actually aid the storytelling to a great degree rather than being their for the pure mystique and surface recognition. The series musical composition is also very pleasing and worth noting. Known his work on Love Live! School Idol Project and Denpa Onna to Seishun Otoko, newcomer Yoshiaki Fujisawa is becoming quite the composer, with this particular soundtrack taking on a fusion of both traditional and modern sounds that are all surprisingly pieced together by synthesizer. The actual soundtrack itself for the series is quite limited, but the non-vocal tracks are just as great as Milktub’s rocking opening theme or the jpop themed ending track. 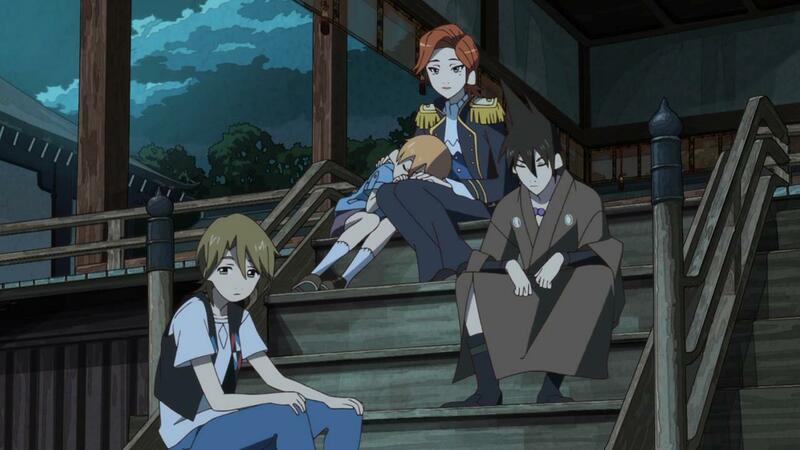 If you have time pick up another short anime series or just passed it over for reasons known to yourself, I highly suggest and recommend giving Uchouten Kazoku – The Eccentric Family a fighting chance. Even if you’re not fond of the drama, it is very light and tolerable to shallow and if you like comedy, it has plenty of light-hearted moments and chuckles to go around; yet not enough to undermind the more poignant moments. It definitely isn’t for everyone, but if your idiot blood is up to the challenge it is a pleasurable and memorable one. Pros: Interesting concept and execution, great writing, interesting characters, amazing artwork and animation style, nice musical score (highly recommend series). Cons: A few loose ends not resolved, few key characters unexplored, drama is sometimes emphasized. I think this, Love Lab and Attack on Titan are the three series i’ve had recommended to me most. I have even more reason to watch Eccentric Family now that you’ve given it such high praise. Were there any other series you enjoyed this season? There are very few that I liked from this season, but the others would have to be: Love Lab, Gin no Saji (Silver Spoon), Fate/kaleid liner Prisma Illya, and Rozen Maiden Z.